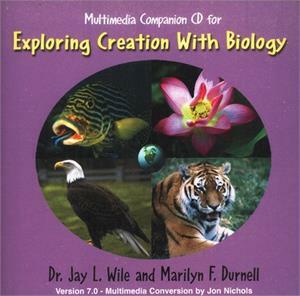 This CD is designed to be used with the high school biology textbook, "Exploring Creation with Biology,".It contains multimedia features that cannot be included in a print textbook. Included are videos of the incredible creatures studied in the course. In this CD, you will find several videos of live microorganisms, cellular processes, and many of the amazing animals which inhabit the air, water, and land. 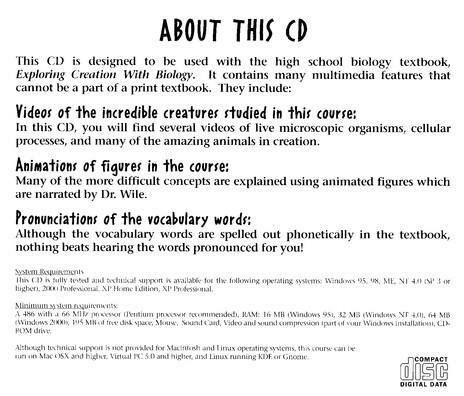 Additionally, the CD includes animations of figures in the course. Many of the more difficult concepts are explained using animated figures which are narrated by Dr. Wile. Finally, there are pronunciations of the vocabulary words. Although all of the vocabulary words are spelled phonetically in the textbook, nothing beats hearing the word pronounced for you!